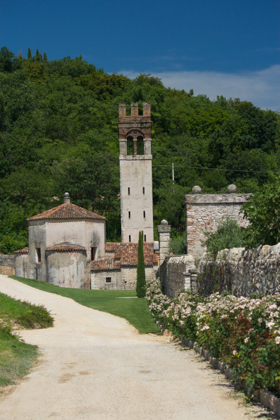 Allegrini is headquartered in the impressive 16th century Villa della Torre in Fumane in the heart of Valpolicella in Veneto. 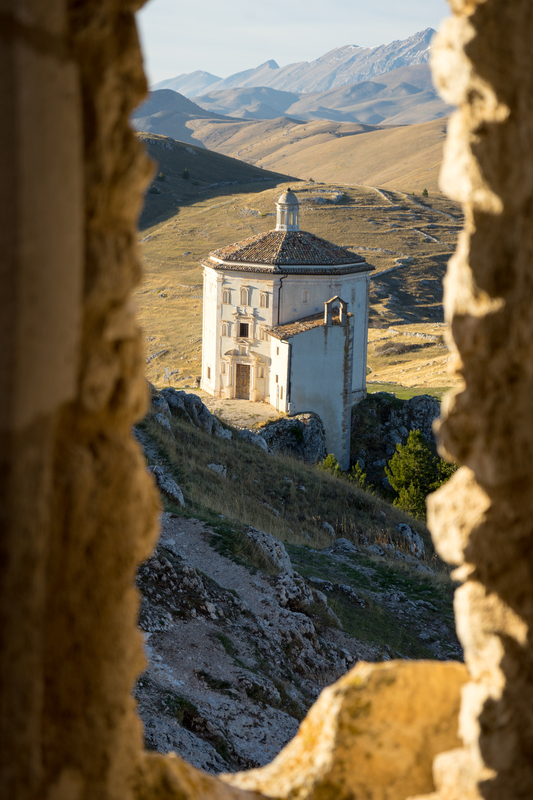 The fortress-like villa was commissioned by Giulio della Torre, a well-known merchant from Verona, employing three important architects of the time (Giulio Romano, architect of the Palazzo Te in Verona, Michele Sanmicheli and Giovan Battista Scultori). 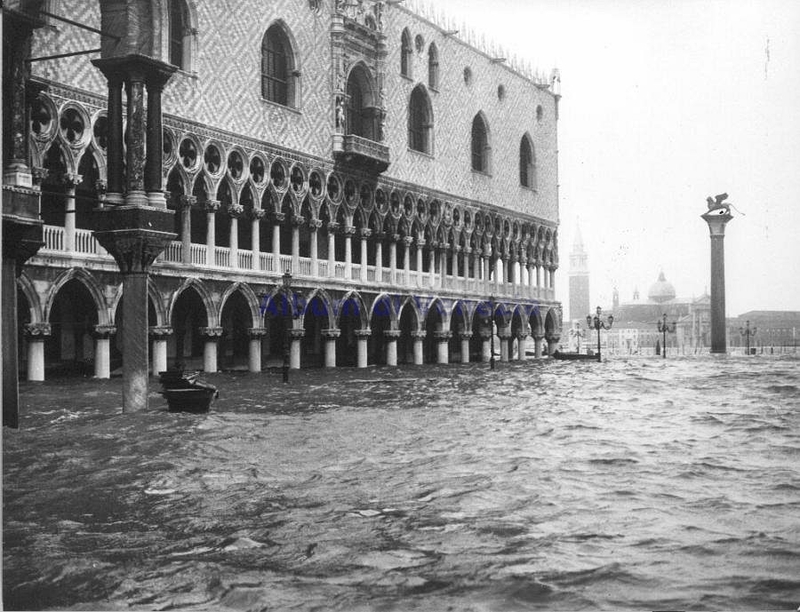 It was built as a country retreat and has been used to entertain important guests including the Doge of Venezia (who would travel for 2 days to arrive). 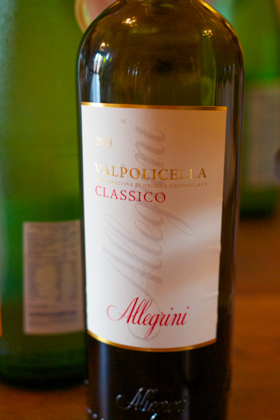 In 2008 it was purchased by the Allegrini family. Marilisa Allegrini played here as a child as her father first leased, and later purchased, the surrounding vineyards (now called Palazzo della Torre). The villa is unique in its layout and theme. 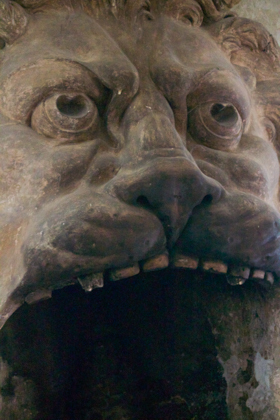 The villa is comprised of three levels to symbolise the ascent from hell to heaven, a theme that is reflected in various forms throughout the villa. 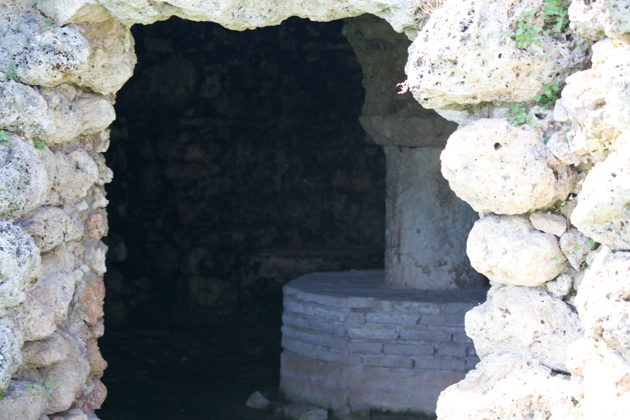 Starting at the bottom level, there is an octagonal cave which has an entrance marked by a mask. 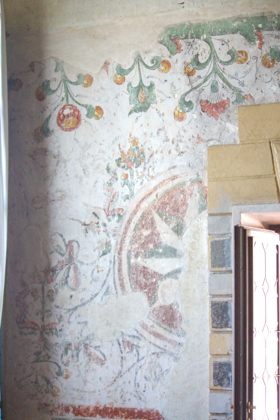 Inside, there is a sea ambience with the walls decorated with snails, shells and pebbles. While the function is unknown, many hypotheses exist, including a Turkish bath or a secret place in which to read illicit books or to worship the god Demetra. Today the area in front of the cave is used to host weddings and concerts. The next level of the villa is a grand terrace with a bridge over a fish pond. 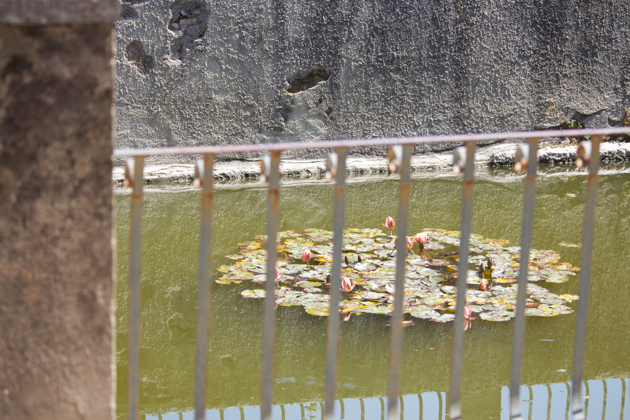 The pond is symbolic of purification as one moves from hell to heaven. Fish were once caught for sport and then returned to the pond to swim free. The bridge itself is off centre, a feature created as a reminder that only God is the perfect creator. 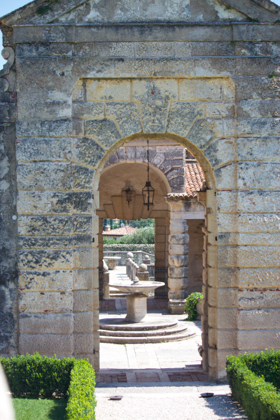 Crossing over the bridge, one enters a courtyard, which replicates the style of an ancient Roman house but with a central fountain instead of a well. 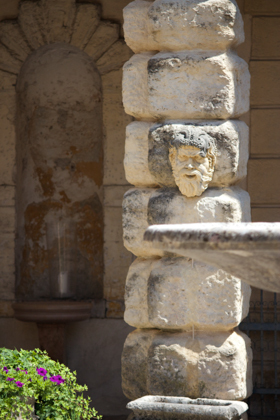 The water in the fountain symbolizes water’s function as a life force. 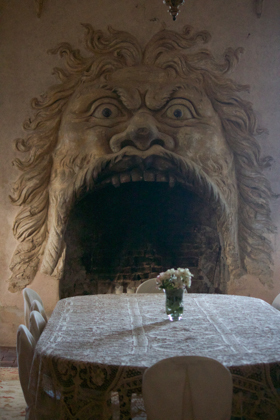 On one side of the courtyard is a large room for hosting guests with an incredible fireplace in the shape of a lion’s face with a large open mouth. 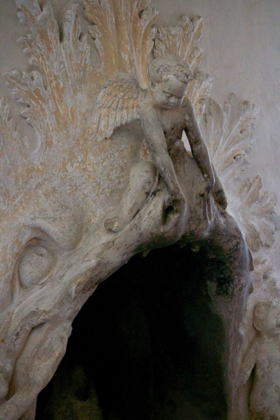 On the opposite side of the courtyard are several ornately decorated rooms for hosting guests each with three monster relief fireplaces portraying spirits or animals, each with their own meaning – good and evil. 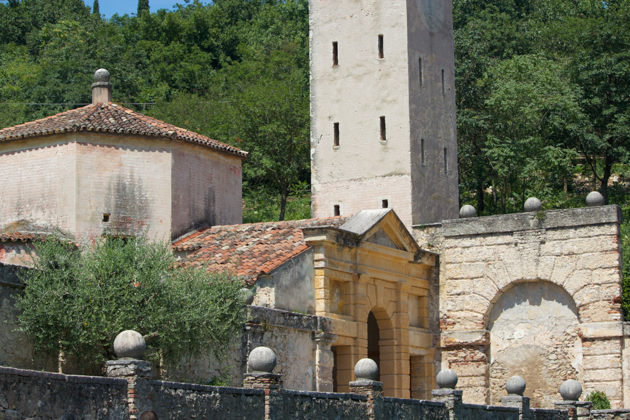 On the far side of the upper courtyard to the right is the Tempietto (a chapel). This is the highest level, representing enlightenment by God. 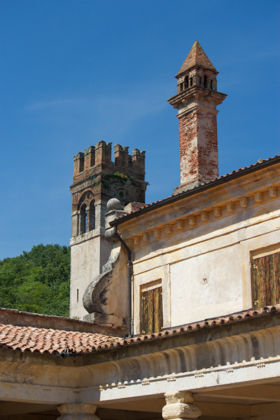 The Renaissance chapel was designed by Michele Sanmicheli and has a Bell Tower, alluding to the family name “Della Torre”. 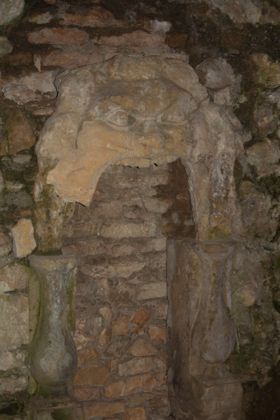 The altar was originally in the centre to demonstrate that Christ-centred worship but has since been moved to the rear wall. 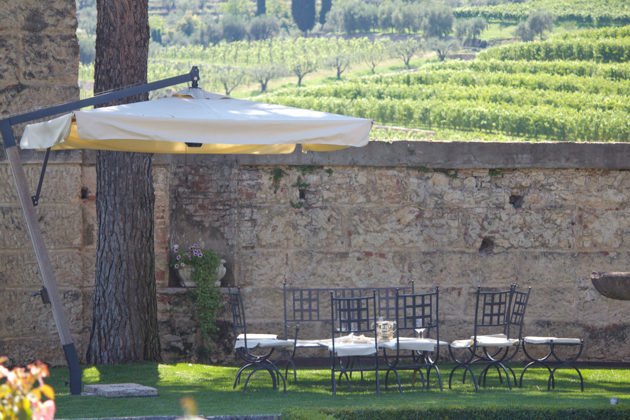 The tour of the villa was followed by a wine tasting. In my version of heaven, there is definitely a bottle of Amarone waiting for me. 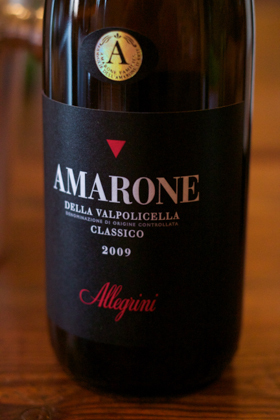 The owners of Villa della Torre, the Allegrini family, are one of the largest wine producers in Valpolicella producing 1 million bottles per year and have been one of the most important players in raising the profile of Amarone internationally. They have been producing wine since 1862 and are now in their 5th generation of winemaking and are known for their fair prices on their high quality wine. Brother and sister, Franco and Marilisa Allegrini run the company. 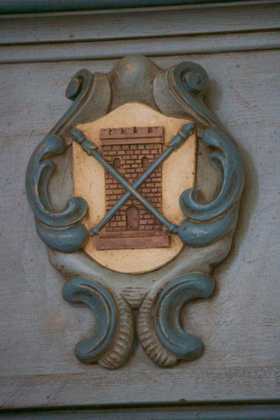 Their older brother, Walter sadly passed away in 2003 and one of their Tuscan wines is dedicated to him – Dedicato a Walter. 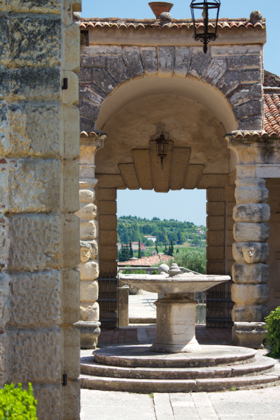 Like most winemaking families, it was not until the 1970’s and 80’s that they started producing quality wines. 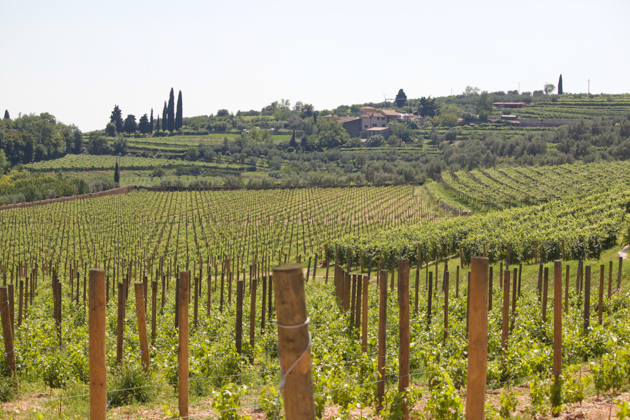 Allegrini started buying land on the hillsides in Valpolicella as they understood that for making better wine they needed better sun exposure and soil drainage. They also changed their vines from pergola to Guyot as they could plant more vines per hectare, their focus shifted to the grapes rather than the leaves and the Guyot system gives the grapes greater exposure the to sun. The results have been excellent and they have been able to introduce single vineyard wines such as Palazzo della Torre, La Grola and La Poja. 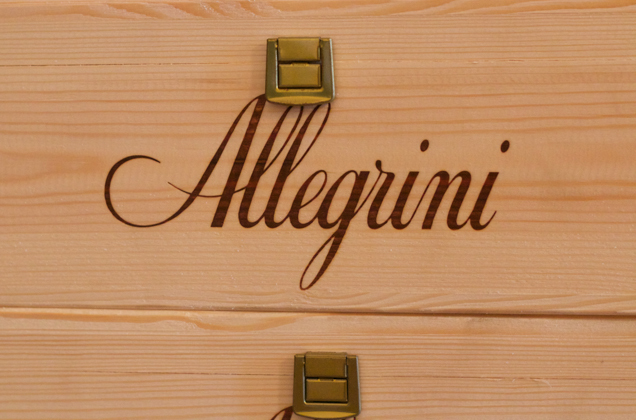 Allegrini owns 100 hectares in three valleys in the Classico appellation of Valpolicella (Fumane, Sant’Ambrogio and San Pietro Incariano). They use only their own grapes in their wines and focus is on the classic red wines of the region: Valpolicella, a cru wine made from raisined grapes but with an innovative take on the ripasso style (named Palazzo della Torre), Amarone and Recioto and two single vineyard red wines (La Poja and La Grola). They also produce a white Soave wine. Allegrini also makes grappa from the grape pomace left over from making Amarone and Recioto, olive oil and red wine vinegar. They also own other wineries: Corte Giara in Veneto, Poggio al Tesoro in Bolgheri (Toscana) and San Polo in Montalcino (Toscana). Their wines are sold in in over 70 countries all over the world including China. 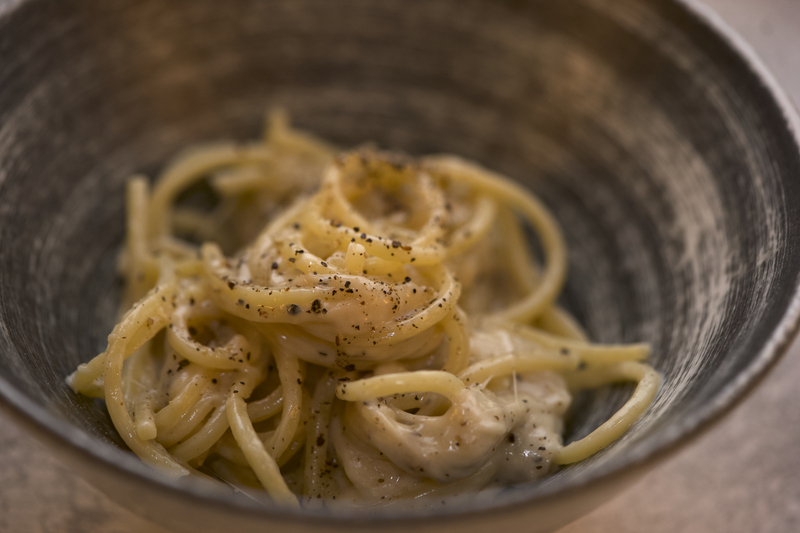 Note: Gambero Rosso ratings are out of a maximum of 3 bicchieri. This wine is made from 80% Garganega and 20% Chardonnay grapes. They produce 50,000 bottles per year. This is their entry-level wine and is made with 60% Corvina Veronese, 35% Rondinella and 5% Molinara grapes all grown in Fumane. It has 13% alcohol. They produce 300,000 bottles a year. We tried the 2013 vintage which had a sour cherry flavour. 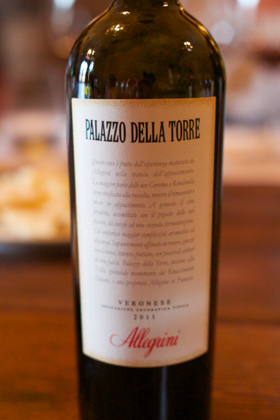 This is Allegrini‘s ripasso- style wine in which they use raisined grapes from the Palazzo della Torre vineyard. About 30% of the grapes are dried for 3 months (rather than soaking the fresh juice on the dried skins leftover from making Amarone) and aged for 15 months in French oak. It is made from 70% Corvina, 25% Rondinella and 5% Sangiovese grapes grown in Fumane. It has 13.5% alcohol. They produce 300,000 bottles per year. We tasted their 2011 vintage and felt it was good value. Timing: drink within 7-10 years. This wine is from the La Grola vineyard in Sant’Ambrogio where the soil is rich in limestone and clay. 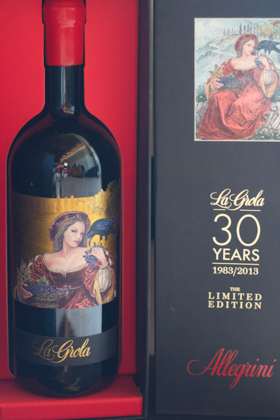 It is made with 80% Corvina and 20% Syrah grapes. They produce 200,000 bottles per year. 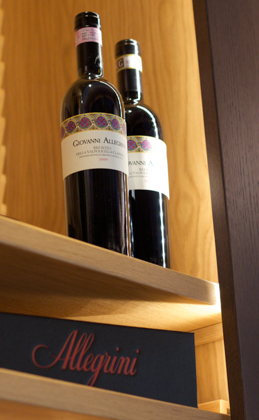 This wine is made from 80% Corvina, 15% Rondinella and 5% Oseleta grapes. The grapes are dried for 4 months before pressing and spend 3 years in oak. They make 125,000 bottles a year. Their best recent vintages to date are 1997, 2005 and 2006. This wine is from the La Poja vineyard which is the top of the 2.5 hectare La Grola vineyard in Sant’Ambrogio. 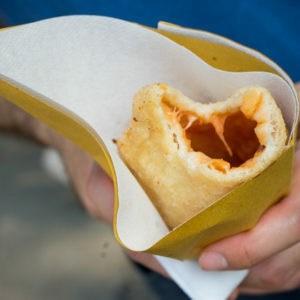 It is unique in that it is unblended, made from 100 % Corvina Veronese. The grapes are harvested 2 weeks later than the other grapes and are not dried before pressing. They produce 14,000 bottles a year. Their best recent vintages are 2001, 2004, 2006 and 2007. This sweet wine is made from 80% Corvina, 15% Rondinella and 5% Oseleta grapes. The grapes are dried for 5 months before pressing. They produce 25,000 bottles per year. 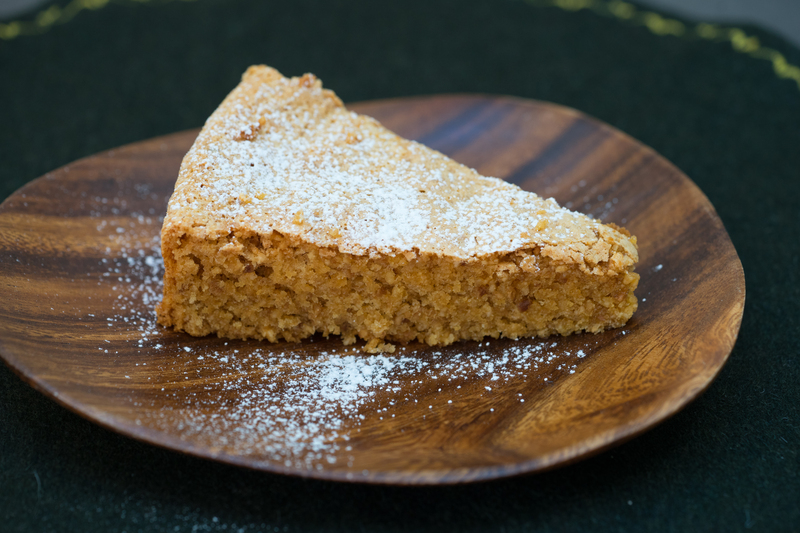 « Where does the best olive oil come from? Grazie for a most comprehensive and enlightening post about Allegrini. Thank you for visiting and experiencing our wines. Thank you for your kind words. We very much enjoyed the visit and the wines. Thank you for a great tour and the tasting.